Let’s talk weaknesses. Since everyone has them, they really shouldn’t be a big deal, right? Sort of. 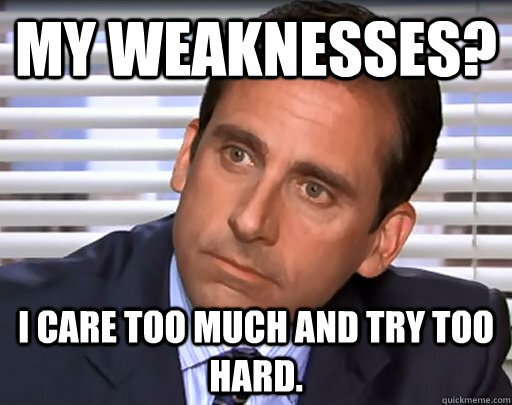 There’s this game that interviewers like to play with job candidates where they ask the question, “What’s your greatest weakness?” I call it a game, because you’re supposed to make yourself look the best you can but you still have to own up to being imperfect. The goal of this game is to look best at downplaying your weaknesses against other candidates. Unfortunately, your interviewer is bound to ask this question during your job interview. And it’s completely reasonable. No candidate is absolutely perfect, and it’s only fair that your interviewer knows at least some degree of your flaws upfront. Plus, this is a good gauge for employers to see how you’ll handle responding to a difficult question. Talk about a big question. A big question in which the answer could significantly impact your life, both immediately and long term. There are many reasons people pursue advanced education after being in the working world; in pursuit of a higher salary, job advancement, knowledge, to make a career change, or maybe you just really miss your college days and hope to relive every scene in Animal House. Those are just a few of the reasons. People have a variety of motivators for considering advanced education. Below are 5 questions you should ask yourself when considering if it is time to go back to school? 1. What is your motivator? Being certain about your end goal will help with answering the next 4 questions. If you are seeking a career change and you know the job market for that career will still be in demand when you have the degree is much different than the motivator of hoping to obtain a higher salary in your current role. 2. Financially is it worth it? This is especially important if continuing to work while going to school is out of the question. Will the return on the investment pay off long term in your career path? How will going without a paycheck for X number of years impact your retirement? What type of debt might you incur by going back to school? Planning a new career move requires a well-planned strategy. While there are several factors that can be the driving force of your desire to make a change; such as employer financial stability, limited advancement, or personal reasons. Once you begin considering a change you must also consider how active you plan to be in your search and how that impacts employer perception of you as a candidate. How often during the month am I pondering a career change? Am I reasonably happy at my current job/employer and not actively seeking new employment but would be open to considering a new opportunity? If your answer to question #1 is “3-4 times each month” and your answer to #2 is that you are actively applying to jobs, you are considered as ‘active talent’ through the eyes of a prospective employer. If your answer to question #1 is “rarely” and your answer to question #2 is “yes”, then you are considered as ‘passive talent’ or “explorers” through the eyes of a prospective employer. Once you’ve defined your level of interest, if you are a passive candidate, odds are you intend to be more inconspicuous in your search. You should also know that from an employer’s perspective, in more cases than not, passive talent is more attractive than active talent. 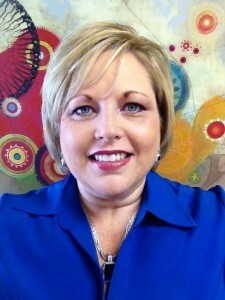 This is due to the stereotype that once hired, “passive talent” is likely to be more loyal and more stable than “active talent.” Noting that this does not mean that “active jobseekers” are poor candidates; they simply have to be aware of the label associated with other active talent and differentiate themselves during interactions with prospective employers. This can be done by not appearing over anxious or desperate during the search process. 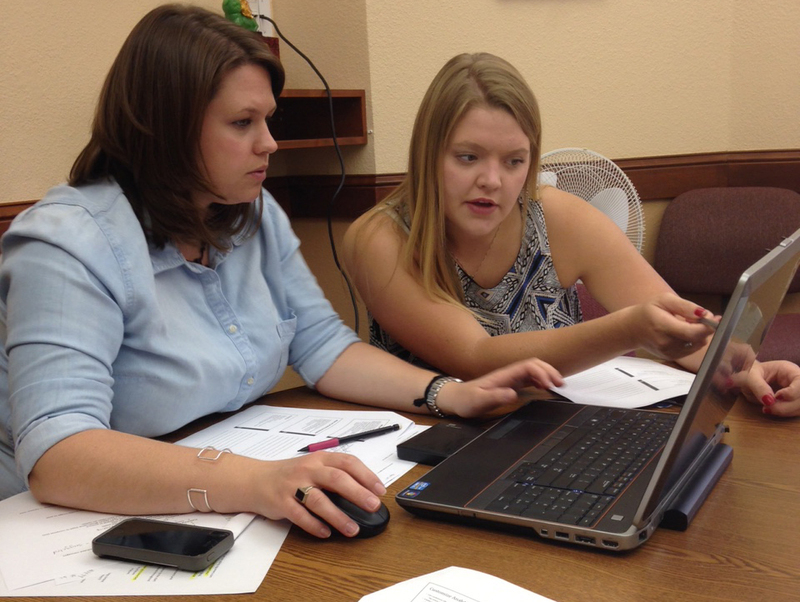 Victoria (right) working with our Education and Marketing Manager Ashley Collins. A mother lets go of her toddler as it takes the first steps into the world by itself, but remains close by to supervise. An employer lets go of the intern’s hand as they take their first steps into the “grown up world” and begin the journey of the career and professional life. As an intern, we are all toddlers taking our first steps by ourselves. We are still needing our parents (mentor) to teach and give us the tools and skills to become a successful experienced professional but to provide those from afar in a supervisory role. 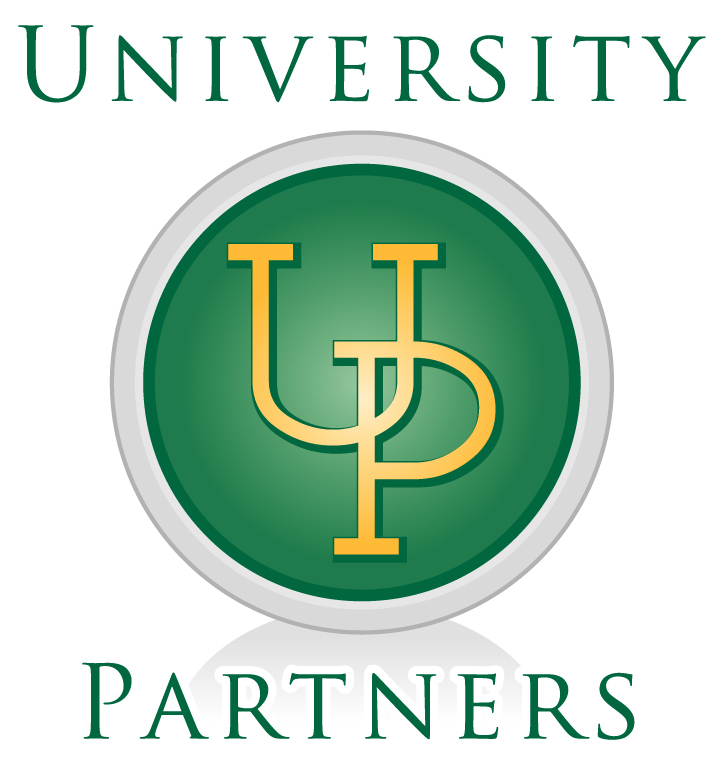 Internships are the exciting, dreaded professional development rite of passage every college student and young professional seeks to experience before starting their career. For many interns, it is a time where you get your first taste of the “grown up world” and a chance develop professionally. Reading never was top of my priority list, not for school or personal enjoyment and certainly not, when it came to professional development. When I first started my career, fresh out of college, I thought I was done with reading novels, textbooks and Cliff Notes! My first job was also my first relocation, to the tune of 1,000+ miles away from home. My new boss sent me along my way with reading material, Who Moved My Cheese, by Spencer Johnson, a book about dealing with change in your work and life. I thought to myself, yeah ‘both are changing but I don’t need to read a 95 page book about it, I am living it every day’ and I was done with required readings, that was not in the job description! Well when you’re 1,100+ miles from home, working in a small office where 95% of your co-workers are 20+ years older than you, your social calendar can be a little empty that first week or two. I found myself picking up that book to read out of boredom one night. There were some parallels I could see between these mice and my life, but I was glad to see the end, and shelve that one! Unfortunately, I kept this attitude through too many of my influential, professional development years as a young person in the working world. Around year seven or eight, as I became more involved in business planning activities, I realized that successful people all around me were referencing books they had read or were reading, and applying them to whatever scenario we were planning. As part of my role at the time I was conducting trainings for college students and again there was my boss with a book recommendation. He had recently head the author speak at a conference and read her book now he thought I should mention it as a resource in my trainings. Well you can’t promote a book if you haven’t read it! So I did, They Don’t Teach Corporate in College, by Alexandra Levit. Wow. Everything in this book was dead on! They sure as heck don’t! Why had I not read this book in year one of my career, what a difference it would have made? And what else was I missing out on because I wasn’t reading? Professional Development books provide deep insight on such a variety of aspects in your career; how to deal with your co-workers, how to be better at your job, outside factors that impact your job, company and industry! You’ve jumped through flaming hoops to find and apply to a new job opportunity. Learned the art of contortion to successfully navigate the tangled web of candidate screening and interviewing. Launched yourself out of a flaming cannon when you notified your employer you landed a new job opportunity. What death defying performance remains? Limber up for the tight rope – the exit interview. 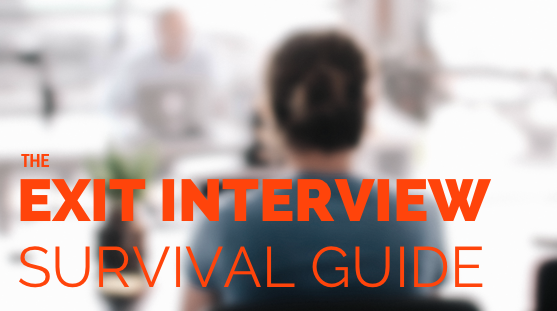 What is an exit interview? An exit interview can be any form of questionnaire or dialogue to learn more about your experience as an employee at your current role within a company. It’s called an exit interview because these typically occur once you are exiting or leaving the company. Why does it matter now – I’m leaving? It matters a lot! Maybe not for you, but for the company and the fellow co-workers you are leaving behind. This is a discovery opportunity for the company, to learn how to improve operations, culture, leadership, etc. Your feedback can help influence much needed change. If you haven’t heard of hydroponics, you probably will soon, as they could become a mainstream form of agriculture in the next several years. Hydroponics is a method of growing plants or crops with mineral nutrient solutions in water in place of soil. This particular position calls on applicants to work with hydroponic produce. Click here to learn more about this job and apply to it. While Skype has essentially become a mainstream tool for connecting face-to-face over long distances, many candidates don’t consider certain factors when interviewing for a job opening via Skype. 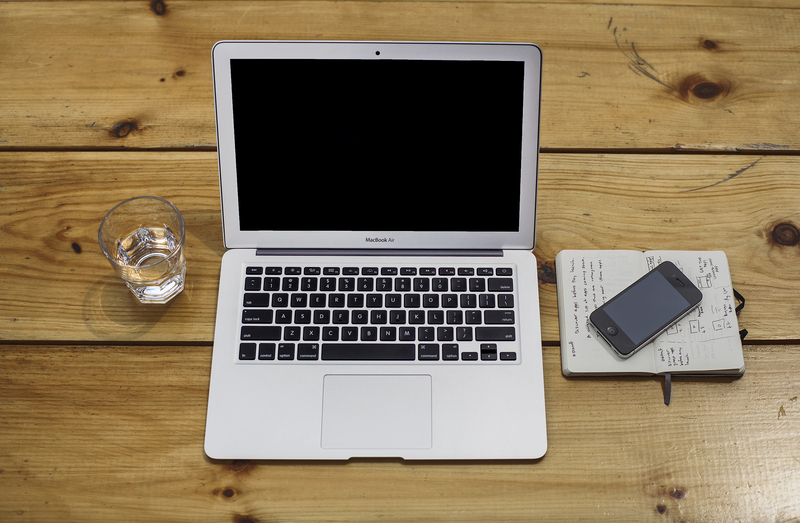 Read these tips to make the best of a Skype interview you may have coming up. Save Money. It’s a very efficient way to utilize staff time. Job-mimicking: Seeing how candidates perform in “almost live work environments” is very valuable! Simulated group activities are often used in group interviewing and can be revealing to say the least.